The FOM-1 is similar to the block module with the exception that it uses an external optical sensor to detect train movement. Although designed for Free-mo modules, the FOM-1 can be used on any model railroad layout where optical detection is required. The FOM-1 board consumes very little current. 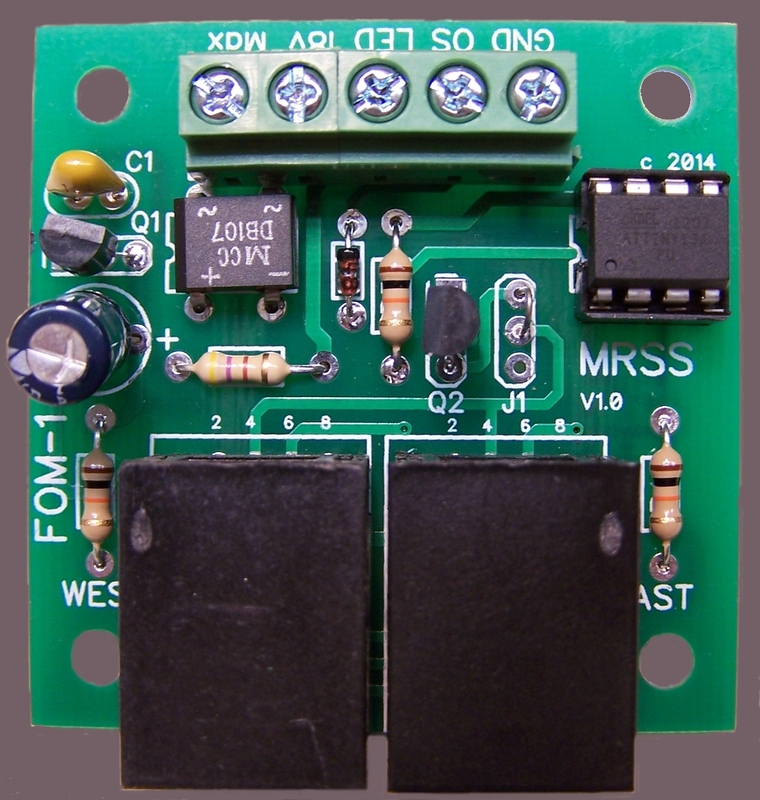 The board can be connected to either the DCC bus or a 12 volt power supply. The Optical Detection Module has been designed for universal operation. The occupancy bus is compatible to work with any Free-mo module that follows the Northern California Free-mo wiring standards for the occupancy bus. * Microprocessor controlled for smooth signal operation. * Low power consumption with an operating range between 8 and 18 volts, AC or DC. * Follows the Northern California Free-mo wiring standards. * RJ45 jacks provide easy occupancy bus connections. * Terminal strip for easy power and optical sensor connections. Connections to the FOM-1 board are very simple. There are two screws to connect power and three for the optical sensor. 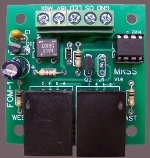 The FOM-1 board operates on an AC or DC input voltage between 8 and 18 volts. The FOM-1 can be powered from several sources. The maximum current draw for the unit is about 45mA. The recommended optical sensor to use with the FOM-1 is the OPB704WZ. The sensor is made up of an infrared LED and a photo transistor. Another option would be to use standard infrared LEDs and photo transistors. Either option will work and both are connected in the same manner. The FOM-1 can be connected to other Free-mo signal boards that are compliant to the Free-mo wiring standards for signalling.